Some collectors dwell on what they get. Quantity. The most autographs. Lee Harmon is different. He gives. For every Met signature he receives, he creates a tribute for that team member. 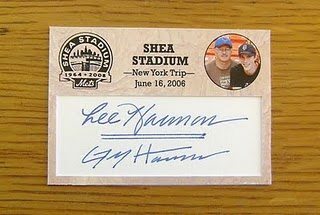 The Amazing Shea Stadium Autograph Project seeks to collect a signature from everyone who ever played at that famed ballpark. In return, Lee writes an online salute to every Met who signs for him. A textbook example of team collecting done right, he shares his hobby secrets and blog history with BBTL readers. Q: How did the idea for this project come about? A: For many years I have been collecting signatures from each man to appear in a game for the New York Mets. Autograph collecting started with me as a way to keep a part of the game. A memento of the day and game attended. None are better than those coming from the men that are a part of my favorite team’s history. As a boy I collected baseball cards. Both have and do enjoy them, but the influx of too much product became cost prohibitive. So I decided that collecting signatures on the Mets cards in my collection was a good solution. Only problem was that many players did not appear in a New York uniform on their card. So for many of those I obtained an index card with their autograph. They seemed boring. So I began the process of designing a custom card design to better display the signatures. Once I decided on a design it developed into the idea of creating a “one-of-a-kind” set. That is when the thought of developing a tribute for the men that wore our uniform during the Shea Stadium era first began. Q: Why customs, not just a 3-by-5 or signed baseball card from each? A: The selection of the pictures to use and the creation of the cards themselves has become almost as enjoyable as seeing the final product with a signature. Designing the cards is definitely a big part of the fun in collecting it. Q: When and why did you choose to share the progress on a blog? A: I started the collection in October of 2008. Just days after the last game was played at Shea Stadium. The blog came almost a year later on October 2, 2009. Friends would ask me how the collection was coming along and I thought an online presence might improve the communication process. Then, as I have at the ballparks throughout the years, I continued to meet some of the nicest people through the autograph collecting hobby. With the blog those people have come from a greater distance than ever before. It has always been known to me that the only way I will complete this project is with much help from others. Without the blog I might never have met some valued friends that I have now. True Mets fans like Jessie Burke for example. Q: Your profiles of each player are well-written and FUN. How do you research each Met? A: My family and friends have teased me for years about always having a story about each Met. Honestly I believe that I bore most people except fellow Mets fans. They understand. More than any other club in baseball history we have consistently had the greatest characters to have played the game. After all we started with the colorful Casey Stengel as our first leader. We may not have won every year, but the seasons have been made special by the men that played in blue and orange. So it is easy to write the tales that have been so great. It is just important to do them justice and research the facts and separate that from the legend. For that I use as many actual quotes as I can find. Those come from a variety of sources from the web, and on the best of occasions from discussions with the actual players themselves. My favorite of those to date has to be Brock Pemberton. I knew very little about him until having an amazing conversation with Brock over the phone. I find it easier to identify with the players that possessed a shorter career. My personal desire to play was always much greater than my talent. These men worked to earn everything they accomplished. Never giving up on the major-league dream. Q: I think some readers would want the details of a guy’s career as a Met. Other collectors would want to skip to the bottom to see how and when the player signed. Have you ever thought about your readership divisions, how many are pure Met fans, pure collectors or all of the above? A: I purposely add the method I obtained the signature. It is indeed to serve those fellow collectors in the completion of their personal projects. 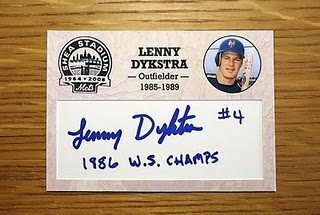 In no way is building a collection of the Mets all-time roster in autographs a new idea. Countless fans have these sets in either index cards, photos, postcards, or baseball cards. Working on their collections years before I even started my own. It has been fun getting to know many Mets fans and being able to assist each other. There has to be so many more that I have yet to meet. I seem to learn something new about every player I research. Still I know there are Mets fans that read very little they did not know before viewing my player profiles. So I never fool myself into believing that the sole interest in the blog is as a historical reference. Although I do attempt to provide a unique insight into these men that are so special to our baseball memories and hope that readers enjoy that. Q: How do you make your Shea Stadium customs? A: I purposely tried to make them simple. If you realize that I have constructed multiple copies of almost all of the 791 cards it was a necessity. I create a file in Photoshop and print that out to paper for both sides of the card. Those are mounted to card stock and glued together sandwiching an index card in-between. Everything is cut out using an X-acto knife. You can gain surgeon-like skill with practice. Q: What players have been most delighted about your customs, with good comments or requests for extras? A: Players that never had a production card in a Mets uniform are often anxious to get personal copies of the cards. However, others have been fans of the design too. Lance Johnson asked for three copies. One for each of his triplet daughters. I am always more than glad to produce any cards they desire. It is a privilege to give something back to my summer heroes. Current local Indiana resident, Ryan Thompson asked for a couple copies when he signed my copy in-person. I have made them and not run into him since. So, Ryan I have not forgotten and promise to get them to you! Q: Do you have examples of players replying with even a letter, offering specific Shea memories? A: Recently I have added a questionnaire in some mail requests. The idea of that came from that very thing, I noticed that players would occasionally add those memories on letters back to me. It has been helpful. 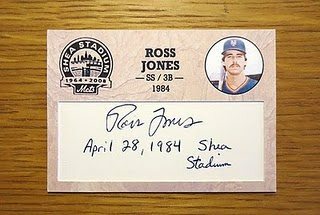 For instance just recently I learned that Ross Jones’s lone hit as a Met was also his first major-league hit. Somehow I missed that he had not appeared in a big-league game prior to his time in New York. Joe Orsulak told me that his favorite memory was a friend catching a foul ball at Shea. Something I doubt was ever recorded anywhere before. Q: There are a few retirees confused over not signing 3-by-5s because of identity theft warnings by MLB. Has someone not signed the custom, or signed the back? A: I find that the concern is more with the current players. Older players seldom have a problem as they came up with the practice of hobbyists collecting signed index cards. Whatever someone told Nick Evans had to be frightening. The man refuses to sign anything “blank” and forced me to recreate a version that contained a ghosted logo. Then upon seeing that insisted that he had to personalize it to me. Last season he was signing all items without personalization, but when given my card wrote his name into the printed border of the card. His friend and teammate, Daniel Murphy has a better solution. He writes, “Let’s Go Mets!” and then signs his name over that. Effectively adding a watermark below his signature. Clever actually. In older players I got the back of the card signed by Ron Hodges, and Kevin Collins. Both without explanation. It was easy to find examples of vintage signed index cards for each of these. So I had to purchase them to complete their actual cards. Because of this their cards are “signed” on both the front and back in the set. My favorite non-signing story has to be Ruben Gotay. Really enjoyed seeing Ruben as a Met, so that made it even worse. A friend first showed the card to Gotay in Tacoma, Washington. He explained that he could not sign an unlicensed card. Another friend gave it to him in Fresno, California a month later. Same response. I mailed copies to three minor and major league teams he joined without a return. A third friend took the card and asked him in Puerto Rico during Winter League play. Same explanation. One year later, my friend Patrick Segura had the card in Viera, Florida when Ruben and the Cardinals visited the Nationals for a spring training game. Patrick said that Gotay took the card right away and carefully turned it to guarantee a good signature. Then handed it back to him without any comment. Will probably never know what led to his change of heart. Q: It’s so cool to see your own autograph in the collection. The story of how you got to Shea is inspiring! Thinking back to your day at Shea, what are the sights, sounds (or even smells!) of the ballpark you remember first? A: As I mention in the blog this is easily my favorite card in the set. My son, Greg is a baseball fan and a rarity in that he loves the Yankees and enjoys the Mets. We never lived in New York so there has never been an exposure to the daily rivalry that exists in the city. It was vitally important for us to see our ballparks before they were gone. That trip ranks as my favorite major-league baseball moment. For years I had listened to games on the radio and seen my beloved Shea Stadium on television. So when the train arrived at the ballpark the day of the game all was strangely familiar. It was exhilarating to ride the same train that brought many players undetected to games throughout the years. Riding with so many fellow fans of my team was refreshing for an out-of-market fan. Greg thought it strange that I knew so many small details of a place I had never actually been. It was amazing to stand inside and watch batting practice. Billy Wagner, Paul LoDuca, and Lastings Milledge all willingly signed autographs for us making it perfect. I even picked original 1962 Met, Ed Kranepool out of the crowd. Weird as it is, I may have loved seeing that old home run apple most. Q: You are a true historian, including Dan Reilly in your Shea set. How did you learn about him and track him down? A: Daniel is actually pretty well known due to his book. How could one ever have a complete Shea Stadium tribute without the original Mr. Met? The first mascot in all of professional baseball. I first tried to locate Mr. Reilly with the help of a fellow collector and Mets fan, Bob Tiefenbacher. We were unsuccessful in reaching Dan through his book publisher. I researched several news stories and learned he had worked for years with the city. My friend, Jessie Burke was able to arrange a phone conversation between Mr. Reilly and myself. The result of which was a fantastic background of the history of Mr. Met and the man behind him. Later, Jessie was able to get my card signed during a lunch meeting with Dan. Q: Were there others you considered adding: PA announcers, broadcasters, etc. A: There will be at least a total of nine “Special Moments” cards. Only six of which are currently posted. Believe me we should have so many more. Every fan I speak with has terrific suggestions on this subject. Logically they need to be the number that it takes to even the set out at 800. There is the possibility that may grow to 805 or 810. Just too many great ideas of people that were essential to the Shea Stadium story. Q: You’ve created a great hobby network to help you get some tough autographs. Do you have a “most wanted list” of the still-living? How can collectors who think they could get your Shea cards signed contact you to work out a trade? A: As I mentioned earlier, it would be impossible to build this set alone. So many people have contributed to it’s current level of success. Most requiring only my thanks in return. I always credit those in the blog entries. If anyone can help with Wayne Housie, Mike Draper, Jim Tatum or Tim Corcoran. Personally I have never had any success with these men. My want list of missing players is featured on the blog. (They are the players in the checklist that are colored in black.) Please feel free to contact me with assistance on any of those at theharmonhouse@yahoo.com. Q: Any advice for fans of other teams who’d like to try to create a related autograph project? The most important thing is to do something that you enjoy. Keep the focus of what you are accomplishing into something obtainable and defined. This hobby requires patience and can be rewarding if you accept that. I have found that common courtesy goes a long way in building your collection. Just remember that not all players will be anxious to sign autographs. It was never part of their job. Playing baseball was. Hopefully that is what we fans respect them for. Look for the appropriate time and know that if you have a right to ask then they have a right to say no. Does Baseball America Directory Still Assist TTM Autograph Collectors? In talking with Lee, he pointed me towards your article.